On July 5th I will be at GEARcon in Portland giving a talk about my Steampunk travel adventures around the world and some that I have yet to take. I will be giving a visual presentation about all the places I’ve been and the steampunk destinations that I want to go to. So if you have ever wanted to get some inspiration on where in the world to go, I hope you can join us. Help My Dream Come True? What dream you ask. My Steampunk Dream Trip to Paris. What better place for a steampunk enthusiast to go than France! Birthplace of Jules Verne, home of the Eiffel Tower, Museums, Art and Industry! Disneyland Paris with the Nautilus! Mechanical elephants! So for my fiftieth birthday we are making a journey to Paris. Thanks to my husband’s work, he had a bunch of airline miles and hotel points, so we got the basics taken care of. It won’t be a luxury trip, but if nothing else we are going to kick around the city of lights for a week. I love traveling and what little of it that I’ve done in Europe was amazing. I was there briefly when I was about six, of which I remember almost nothing. Then back in 1993, I went on a trip to Angouleme France for a bande desinee (comic book) convention. That is a long and bizarre tale for another time. It turned out to be one of the coldest winters in recorded history and I don’t deal with cold well so I was pretty miserable. I got to spend a very surreal week in Paris afterward but I had a terrible head cold by that point and my host was overly fond of Chinese food so I had a lot of hot and sour soup. I have always wanted to go back and see Paris properly. Why am I telling you all this? Because I’d like to ask you for a little help. For the past six years, I have been working on Steamcon pretty much full time. I do enjoy it, but it takes up a lot of my time and creativity, leaving me with little to spare for myself. If you appreciate all that hard work and you can spare it, I’d love it if you would contribute to my trip fund. I will completely understand if you don’t want to. I really don’t even like to ask, but if I don’t, I’ll never know. The way I see it, I have some very basic goals that I will meet and if I get funded I’ll keep adding slightly bigger goals. I’ll take lots and lots of pictures and I promise to blog about the entire trip when I return so you can live vicariously through me. The biggest expense is a trip to Nantes to visit the Jules Verne Museum and the Machines de L’ile. It requires a train trip and an extra hotel night, but the museum is a must and seeing the mechanical animals up close and personal would be a dream come true. 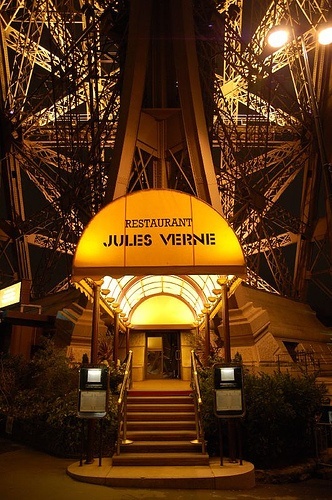 Then, if we raise enough extra I would truly love to dine at the Jules Verne Restaurant inside the Eiffel Tower. It is an expensive meal even at lunch, but it seems so appropriate. So here are my thoughts on the trip and how things can expand if folks are willing to help us out. Basic trip – do walking tours around the city. Eiffel Tower etc. Munch croissants. Sit in sidewalk cafes. Visit the Musee des Arts et Metiers and the steampunk Metro station. A day at Paris Disneyland and especially the Jules Verne portion. A train trip to Nantes to visit the Jules Verne Museum and visit Machines de L’ile. Ride the Mechanical Elephant! Lunch at the Jules Verne Restaurant in the Eiffel Tower on my birthday or if expenses allow dinner instead. Or Dinner at Le Train Bleu, a breathtakingly beautiful restaurant. I am sure I will come up with a few other fun ideas. If you can help out, I’d be ever so grateful. If you have ever wanted to go to Paris or you are curious about the steampunk aspects, this is a great chance to assist with a dream. While I really can’t offer incentives for donating, I do pledge that the person that donates the most will earn a special keepsake from my Paris trip! I have three easy ways you can help out, if you are willing. 1. The first is simply find me at an event and contribute directly to my donation box. It has a copper colored Eiffel tower on it. You can’t miss it. 2. The second is to go to the GoFundMe site I just set up. They do take a cut, so in person is better but if you won’t see me before May, it’s an option. 3. The third is to buy my spiffy new t-shirt design on TeeSpring. It will be up for just 21 days and they will print them only if we sell 30 or more. You will have a very limited edition t-shirt by me and funds will be added to my trip fund. Win/win. I suppose there are other ways to help out, but those are the three I have come up with. Feel free to contact me if you think of something else. I do appreciate any help that you can spare. I am very much looking forward to this trip.